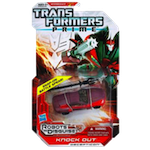 Hunt AUTOBOTS with the fierce AIRACHNID! Conditioned to battle and hardship by her years spent hunting rare creatures across the depths of space, AIRACHNID is a primed and powerful warrior. All of her voyaging has been in preparation for the day she will once again face ARCEE in combat. Now, she has come to Earth in search of her revenge, and more. She has also returned to the service of MEGATRON after her long absence, determined to prove herself as a leader – no matter who she has to destroy to do it. Converts from robot to vehicle! The DECEPTICON hunter AIRACHNID converts from an awesome helicopter to a villainous robot bent on revenge and back. She has snap-on electro-stingers and a triple-bladed sword for trashing any AUTOBOT she encounters. Battle her against your other TRANSFORMERS figures! Includes: Converting AIRACHNID action figure, snap-on electro-stingers, and triple-blade sword. Features: Triple-blade sword!, Snap-on electro-stingers!